When the age-old question “what is for dinner” pops up, I bet that many of us will prefer recipes with just few ingredients found on supermarket shelves, short on preparation and cooking time. A difficult request from an ethnic oriented food website. However, today I will surplus that request and bring you a recipe that beside a spirit of enthusiasm requires virtually no culinary skills to prepare. 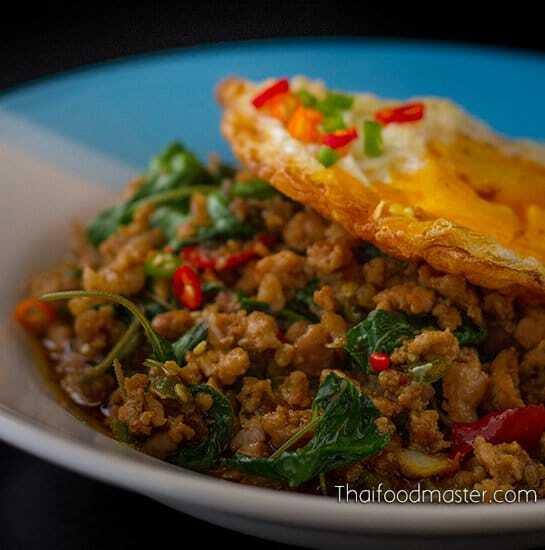 A Thai twist on the good ole’ fried eggs. We will take this prehistoric dish another notch! 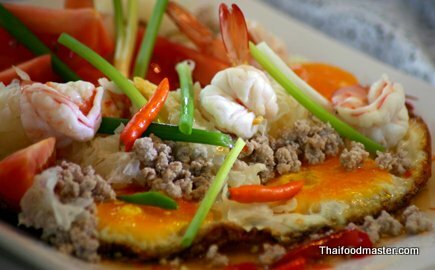 With a simple spicy lime and fish sauce dressing we will jazz it up into an energetic dish that is uniquely remarkable and captures some of the essence of Thai food – the mixing and playfulness in the use of flavors. 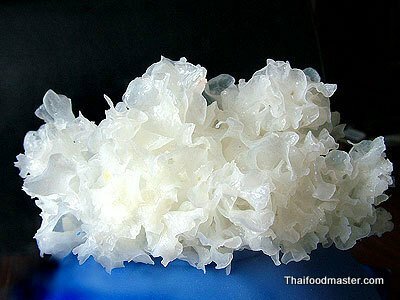 The recipe calls for Cauliflower Fungus (het huu nuu khaao ; เห็ดหูหนูขาว), which I am sure you can get in a dry form at any good Asian market. However, you can easily leave it out and try it tonight. 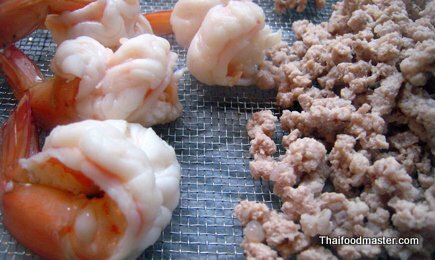 6-8 small to medium shrimp, peeled and deveined. 1 medium size tomato, cut into thin wedges. 2 tablespoon neutral taste cooking oil. 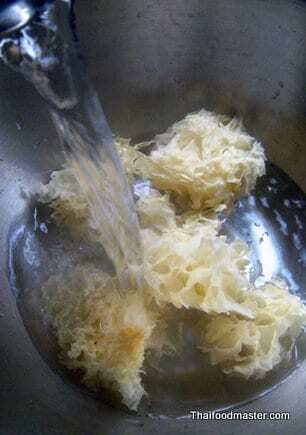 Soak the dried cauliflower fungus in boiling water to rehydrate, for about 10 minutes. 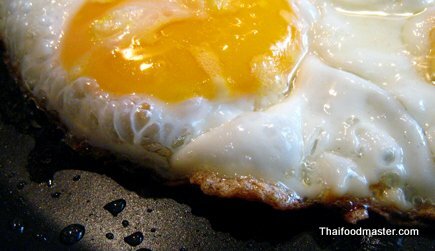 Prepare fried eggs your favorite way. I find that this dish works better when the eggs yolks are still somewhat runny and the edges are golden brown and crispy. Feel free to use your own favorite style. 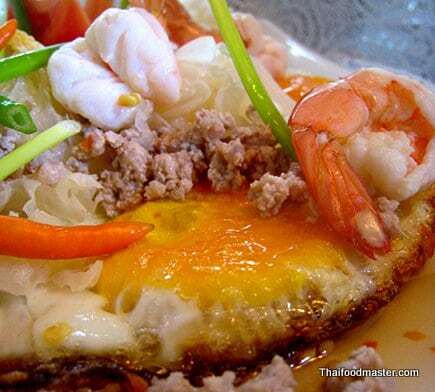 Place the eggs on a serving dish. Bring water to a boil in a small saucepan. Cook the shrimp until just about done. A minute or two – depends on their size. I like to remove them from the water when they are still undercooked slightly, the residual heat will keep cooking it, and they will be perfect when I get to assemble the dish. 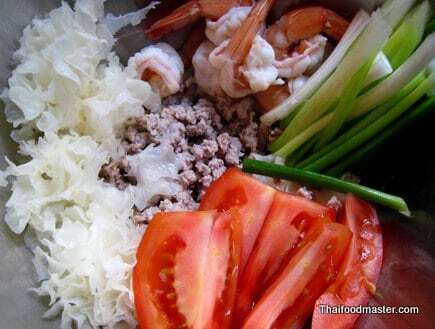 In the same saucepan, cook the minced pork, until thoroughly cooked. Strain the water and set aside. In a mortar and pestle, crush the chilies. The finer you pond it the hotter the dish will be! You can save couple of chilies for decoration. 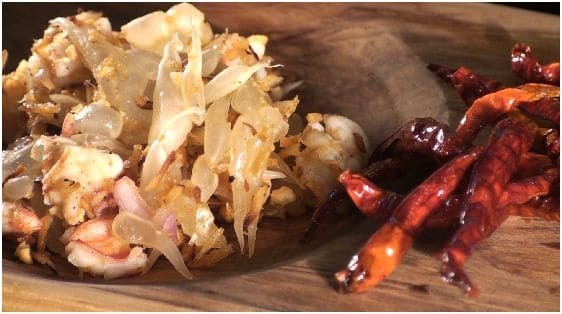 Mix the chilies with the rest of the dressing ingredients, limejuice and equal parts of fish sauce, add the sugar to round the taste. 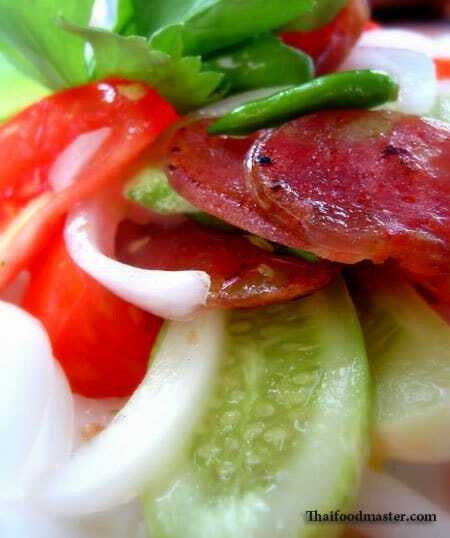 It is a good idea to taste the dressing now and adjust flavors. 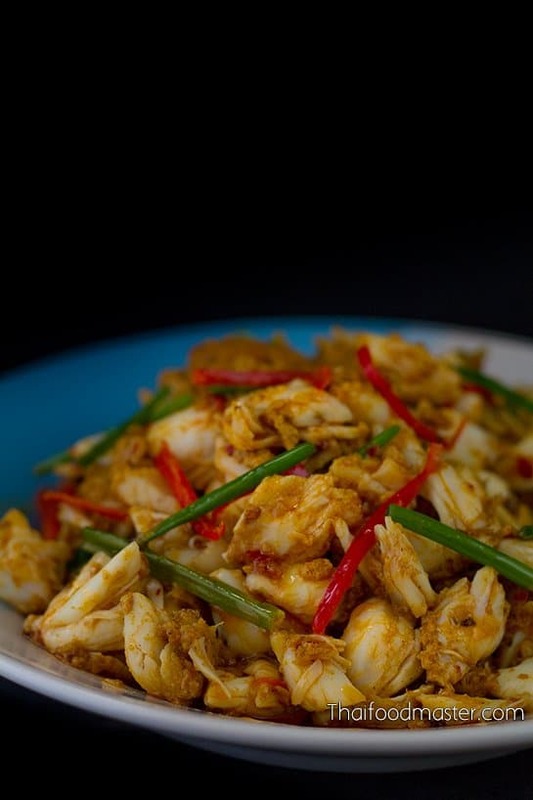 This ratio is a basic guideline – add more fish sauce or lime juice to adjust. In a mixing bowl toss, lightly the cooked mined pork and shrimp, sliced tomatoes, spring onion strips, and rehydrated cauliflower fungus with the lime dressing. 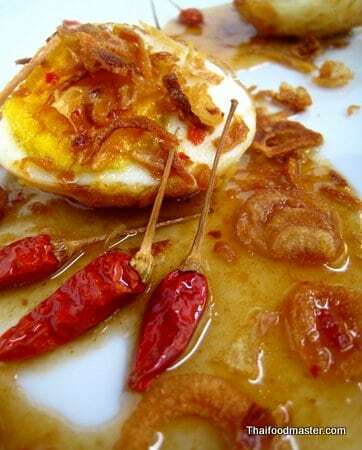 Pour the mix over the fried eggs and serve immediately. Here is a recipe that, according to the legend, shows the efforts of one young man to please his wife’s mother. Using only the very basic ingredients he could find in the pantry, he put together a plate that cannot fail. From the culinary aspect I mean. Because from the grammar point of view we ended up with a dish that is called…. oy vey…. yes, “The son in law’s balls”…. I like the photo of the mushroom.. btw mushroom sounds better than fungus. looks good. 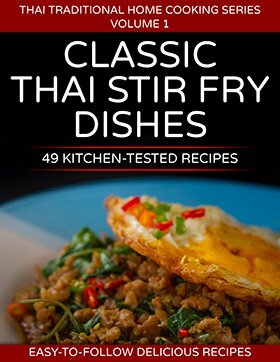 we need more simple recipes for the under-skilled. Easy to make and tasty! Oh, this looks delicious and just easy enough for me to make ! Will try it ! Thanks so much for this link which I’ll also bookmark. ได้รู้จักคุณหนุมานจากรายการ” ฉันรักเมืองไทย” ฉันรู้สึกภูมิใจมากเลยคะ ที่มีคนที่รักเมืองไทยแบบคุณ แม้ว่าคุณจะไม่ได้เกิดที่นี่ even if you are a foreiner but in your heart you are thai indeed.